Upright, mounded variety has a neat controlled habit. 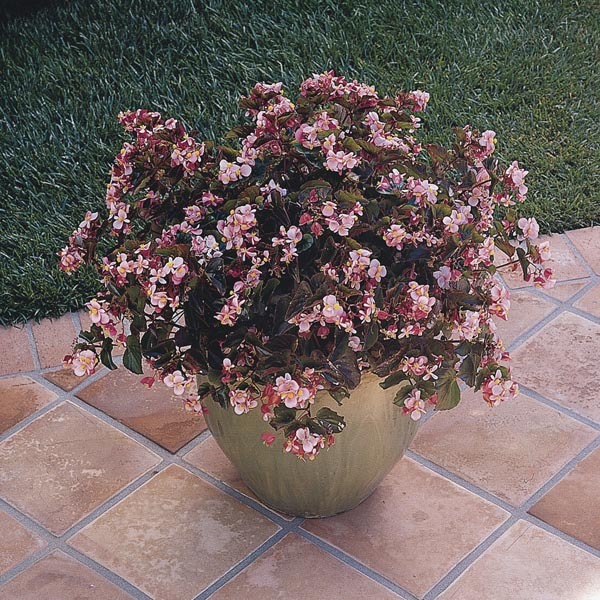 Vigorous, heat tolerant plant with glossy green leaves and large blooms. Blooms earlier than Dragon Wing® and has smaller leaves. The perfect choice for beds and borders. Superb for baskets, containers and window boxes. Wonderful for combination plantings. Every two weeks with mild liquid fertilizer. Best in fertile, well-drained soil. Water as needed to keep soil evenly moist, especially in hot weather. Remove faded flowers for best display. Apply a summer mulch to retain moisture. Prepare the garden by breaking up the existing soil (use a hoe, spade, or power tiller). Add organic matter such as manure, peat moss or garden compost until the soil is loose and easy to work. Organic ingredients improve drainage, add nutrients and encourage earthworms and other organisms that help keep soil healthy. Give plants an extra boost by adding a granulated starter fertilizer or a balanced all-purpose feed (for example fertilizers labeled 12-12-12). Check the plant label for suggested spacing. 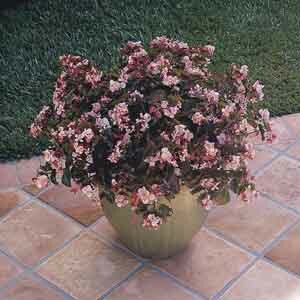 Crowding plants can result in fewer blooms and weak growth as the plants compete for light. Exceptions to this might be regions with a short growing season, shade plantings which tend to grow slower and fill in less quickly, or a need to fill an area with color quickly such as for a special event or if planning to entertain guests outdoors. Remove the plant from the container. If plants are in a pack, gently squeeze the outside of the individual plant cell while tipping container to the side. If plant doesn't loosen, continue pressing on the outside of the container while gently grasping the base of the plant and tugging carefully so as not to crush or break the stem until the plant is released. If the plant is in a pot, brace the base of the plant, tip it sideways and tap the outside of the pot to loosen. Rotate the container and continue to tap, loosening the soil until the plant pulls smoothly from the pot. Vining annuals require vertical space to grow, so provide a trellis, fence, wall or other structure that allows the plant to grow freely and spread. New plantings should be watered daily for a couple of weeks. After that, depending on the weather and soil type, watering can be adjusted to every two or three days. Clay soils hold moisture longer than sandy soils, so expect to water more frequently in sandy settings. Different plants have different water needs. Some plants prefer staying on the dry side, others like to be consistently moist. Refer to the plant label to check a plant’s specific requirements. To check for soil moisture use your finger or a small trowel to dig in and examine the soil. If the first 2-4” (5-10cm) of soil is dry, it is time to water. Too much fertilizer can actually damage plants so it’s important to follow the package directions to determine how much, and how often, to feed plants. Prune plants freely to maintain the desired size and shape. Pinching plants back stimulates dense, bushy new growth and encourages more flowers. Remove old flowers to keep plant looking healthy and prevent seed production that drains the plant’s energy at the expense of forming new flowers. Some plants are grown only for their attractive foliage (such as coleus, dusty miller and flowering kale). Their flowers are not very showy and any buds should be pinched off to keep the foliage looking its best.